number of animals can tolerate ice forming in their bodies, to varying degrees, including some insects and other arthropods, molluscs, nematodes, earthworms, frogs and turtles. How much ice must form in the body of an animal before we can consider it to be freezing tolerant? Most animals will survive some degree of ice formation in their bodies. Even we humans will survive some parts of our bodies freezing, although we will lose the tips of our fingers or toes to frostbite if they freeze. Freezing kills our tissues and we die if more than a small proportion of our bodies freeze. Freezing-tolerant animals will survive the bulk of their body water turning to ice. In fact, some can survive the freezing of all their freezable water. Not all cellular water can be frozen, at least at temperatures likely to be encountered in the environment. A proportion of the water is restricted in its movement by interactions with membranes, proteins and other macromolecules or structures in the cell. This is called 'osmotically inactive water' since it is not free to move under an osmotic stress. Osmotically inactive water is sometimes also called 'unfreezable water', since it does not freeze (at least at temperatures down to — 45 °C), or 'bound water', since it is attached to cell molecules and structures. The term 'bound water', however, is misleading since it can rapidly exchange with the free water in the cell. Osmotically inactive water constitutes about 18 per cent of cell water and hence the maximum amount of ice formed in freezing-tolerant animals is about 82 per cent of total body water. Freezing-tolerant animals survive the freezing of 50-82 per cent of their water. Measurements of freezing survival in the laboratory, however, can be deceptive and we must always bear in mind the conditions to which organisms are exposed in their natural environment. This is particularly important for groups, such as reptiles, in which the ability to survive freezing is poorly developed. There has been considerable debate as to whether hatchlings of the painted turtle (Chrysemys picta), and other turtle species, are freezing tolerant or avoid freezing by supercooling. Freezing tolerance is considered to be relevant to the biology of the animal when it will survive continuous freezing for days or weeks at temperatures usually encountered in its environment and with its ice content reaching a constant level. It is generally thought that animals only survive ice forming in their bodies if it is confined to their body cavities and other extracellular spaces. Freezing of their cells (intracellular freezing) is thought to be fatal. Intracellular freezing is partly prevented by the animals freezing very slowly, over a period of days in some cases. At least one nematode, however, breaks all the rules. As we will see later, it freezes in a matter of seconds and survives extensive intracellular freezing. There are more than 60 species of insects which are freezing tolerant, surviving the freezing of their tissues and body fluids. Most freezing-tolerant insects freeze at — 5 °C to —10 °C but will tolerate freezing to much lower temperatures. Woolly bear caterpillars, larvae of a moth from the Canadian Arctic (Gynaephora groenlandica), will survive freezing to — 70°C and fruit fly larvae (Chymomyza costata) survive temperatures below —100 °C. Larvae of the goldenrod gall fly (Eurosta solidaginis) overwinter in galls on the stems of their host plant. Since the stems project above any snow and the galls provide little insulation, the larvae are exposed to very low temperatures in parts of their range. In winter, populations from the northern United States are freezing tolerant and will survive below —40 °C, with 64 per cent of their water frozen. —10 °C. Since these insects survive ice formation in their bodies going to completion, it is not the freezing process itself which kills them but some other unknown factor at lower temperatures. Most freezing-tolerant insects freeze at fairly high subzero temperatures. This may be important since the greater the degree of supercooling the faster and more violent will be the freezing process when it occurs. By preventing supercooling, freezing is slow and gentle, giving the cells time to adjust to the changes occurring within the body of the insect. The freezing process can be very slow indeed, with H. maori taking 10 hours to reach its maximum ice content at — 5 °C and larvae of the goldenrod gall fly, E. solidaginis, taking 1-2 days at —23 °C. Many freezing-tolerant insects produce proteins or lipoproteins in their haemolymph that act as ice-nucleating agents. Ice-nucleating agents trigger ice formation by binding water at their surface in such a way that it tends to form an ice crystal. These ice-nucleating proteins not only ensure that freezing occurs at a relatively high subzero temperature, and hence the propagation of ice is slow, but they may also prevent fatal intracellular freezing by ensuring that ice formation occurs in the extracellular fluids of the animal. As freezing proceeds in the haemolymph, the ice excludes salts and other solutes from its structure, raising their concentration in the remaining unfrozen portion (the freeze concentration effect). This creates an osmotic gradient that dehydrates the cells, raising their internal concentrations and preventing them from freezing (see Figure 5.1). Not all freezing-tolerant insects possess ice-nucleating proteins in their haemolymph, however, and some may rely on food or microbes in their gut which act as nucleating agents or on inoculative freezing by contact with external ice to produce freezing at high subzero temperatures. A few Arctic insects can supercool to below — 50°C and yet still survive freezing, when it occurs, in contrast to the normal pattern. Many freezing-tolerant insects produce low molecular weight compounds in response to the onset of winter. These include sugars (treha-lose, glucose), sugar alcohols (glycerol, sorbitol, erythritol) and amino acids (proline, alanine). Some of these will sound familiar since they are also produced by freeze-avoiding insects where they act as antifreezes. In freezing-tolerant insects, they play a rather different role, acting as cryoprotectants. Their role as cryoprotectants depends partly on their colligative (water-binding) properties. They depress the melting point and reduce the amount, and rate, of ice formation at any temperature where freezing occurs. Since cell dehydration is a major cause of cell injury, decreased ice formation reduces the cellular dehydration which occurs as a result of the freeze concentration effect. Cryoprotectants that can penetrate cell membranes (such as glycerol) will enter the cells and thus counteract the effects of cell dehydration. Some cryoprotec-tants protect cells by mechanisms that do not rely on their colligative properties. Trehalose attaches to proteins and membranes protecting them against the harmful effects of dehydration (as we saw in Chapter 3 on anhydrobiosis). Since freeze concentration effects result in cellular dehydration, the protective properties of trehalose may be important in tolerating freezing. Desiccation may trigger the synthesis of cryo-protectants and increase their concentration through the loss of water. Some freezing-tolerant insects have been shown to produce antifreeze proteins. This may seem surprising since, in freeze-avoiding insects, these proteins act to inhibit ice nucleation and promote supercooling. Most freezing-tolerant insects freeze at high subzero temperatures and may promote such freezing by producing ice nucleating proteins. Antifreeze proteins play a rather different role in freezing-tolerant insects, which depends on their ability to interact with the surface of ice crystals. If you keep a body of ice frozen at a constant subzero temperature, it is not stable, particularly at high subzero temperatures. It undergoes recrystallisation - slightly larger ice crystals grow at the expense of slightly smaller ones, resulting in fewer but larger crystals. This occurs if you keep ice cream in your freezer for too long - it goes 'icy'. If this change in the size of ice crystals occurred within a frozen insect it could be quite damaging as the crystals grind against the membranes of cells. The antifreeze proteins produced by freezing-tolerant insects inhibit ice recrystallisation since they sit in the interfaces between ice crystals and prevent the exchange of water molecules between them. They can produce this recrystallisation inhibition effect even if they are present in quite low concentrations. Antifreeze proteins from freezing-tolerant insects also show a thermal hysteresis effect (a difference between the melting and freezing point in the presence of an ice crystal), although this has no apparent function in these insects and is a consequence of the attachment of the protein to the surface of ice crystals. Both the antifreeze proteins and the cryoprotectants produced by freezing-tolerant insects might be expected to inhibit ice nucleation, to the disadvantage of the insect. These effects are, however, easily overcome by the presence of potent ice nucleators in the insect's haemolymph and/or gut, or by inoculative freezing. In some other animals (molluscs and nematodes), recrystal-lisation inhibition has been reported where there is little or no thermal hysteresis. The structure of the proteins responsible has yet to be determined but they may well turn out to be a new type of ice-active protein. It is often assumed that insects will only survive freezing if the ice is confined to their haemocoel and extracellular spaces. This has rarely been tested and there are at least two insects that will survive some intracellular ice formation. Larvae of the goldenrod gall fly (E. solidagi-nis) accumulate cryoprotectants (glycerol and sorbitol) and promote freezing by the presence of inorganic crystals (calcium phosphate) that act as ice nucleators. Reginald Salt was the first to report that the fat body cells of E. solidaginis could survive intracellular freezing (the fat body is the insect's equivalent of the liver). These observations have been confirmed and expanded by the work of Rick Lee's laboratory at Miami University in Ohio. Bill Block, and his coworkers at the British Antarctic Survey have claimed that the fat body cells of a freezing-tolerant Arctic fly from the Norwegian archipelago of Svalbard (Heliomyza borealis) will also survive intracellular freezing. The ability to tolerate intracellular freezing may be much more common that we think. However, in my own laboratory, we were unable to demonstrate intracellular freezing in the fat body cells or Malphigian tubules of the New Zealand alpine weta (H. maori), despite the freezing of 82 per cent of its body water. íigure 5.5 Some of the adaptations involved in the survival of subzero temperatures by a freezing-tolerant insect. Insert drawing of a beetle by Jo Ogier. The adaptations involved in the survival of freezing by insects are summarised in Figure 5.5. • inoculative freezing limited to the extracellular spaces of the animal. This is encouraged by the production of ice-nucleating proteins. Sugars and sugar alcohols, which are used as cryoprotectants in freezing-tolerant insects, do not appear to be used in this way by intertidal molluscs. They do, however, produce amino acids (e.g. proline, alanine, taurine and strombine) which appear to act as cryoprotectants. Antifreeze proteins are produced by the blue mussel (Mytilus edulis). These have little thermal hysteresis activity and function as recrystallisation inhibitors. Intertidal molluscs develop the ability to survive freezing on a seasonal basis, with the production of protective compounds triggered by falling temperatures. Freezing tolerance may also be initiated or enhanced by desiccation, increased salinities and low oxygen concentrations. The Antarctic is a good place to look if you are interested in organisms that survive freezing. In 1989, I visited Antarctica for the first time and isolated a soil nematode, Panagrolaimus davidi, which I have kept in culture in my laboratory ever since. P. davidi was isolated at Cape Bird, Ross Island from an ice-free area where algae were growing on loose soil and shingle which received meltwater from an adjacent snowbank. Here, temperatures do not rise above 0 °C for much of the year and the nematode is likely to remain either frozen or dry for at least eight months. During the spring and summer, there is sufficient heat from the sun for liquid water from melting snow to be available. Even then, the substrate periodically freezes. When I revisited the site in the spring of 1997, it was clear that the nematode's habitat was freezing and thawing on a daily basis during that part of the year. The nema-tode is thus regularly exposed to freezing and has to survive inoculative freezing from the ice surrounding it. The optimum growth temperature of P. davidi is, perhaps surprisingly, 25 °C and it does not grow at all at temperatures below 6.8 °C. At 25 °C, the nematode will complete its life cycle in just seven days. However, temperatures are above its threshold for growth for only short periods of the day and year. Ian Brown, who did his doctoral research on this nematode in my laboratory, has calculated that P. davidi is lucky to complete one generation a year in its natural habitat. It shows resistance adaptation to the extreme conditions - surviving and lying dormant for much of the time and growing rapidly during the brief periods when conditions are favourable. Freezing is a major stress for the nematode, although its substrate must also desiccate when sources of water, such as melting snow, become exhausted. 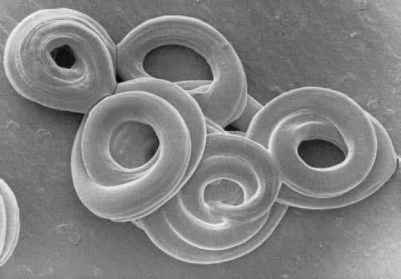 The nematode is freezing tolerant and will survive freezing in water to temperatures as low as — 80 °C. Nematodes are transparent and we can observe ice forming in their bodies when they are cooled on a microscope cold stage. Freezing is obvious since the ice scatters light and the nematode suddenly darkens when it freezes. The darkening of the nematode is so complete I found it hard to imagine that the ice was confined to its extracellular spaces. In 1994, Donald Ferns, a student research assistant, and myself set out to determine where, and how, ice formed in this nematode. To do this, we used a cold microscope stage mounted on a research microscope, which allowed us to observe the freezing process at a high magnification. This was recorded on video, which could then be analysed frame by frame. 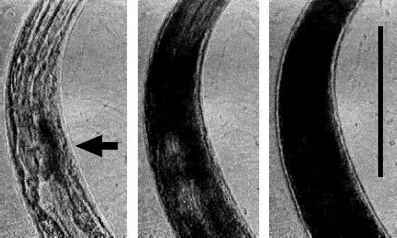 figure 5.6 The freezing of the Antarctic nematode Panagrolaimus davidi starts near the posterior bulb of the oesophagous (seen as a darkening as indicated by the arrow). Freezing spreads throughout the body until all body compartments freeze. These pictures are taken from a video sequence of the freezing of the nematode. Scale bar = 100 ^m. From Wharton & Ferns (1995), reproduced with the permission of the Company of Biologists Ltd.
freeze substitution). The ice crystals are found throughout the cells of the nematode but are restricted to the cytoplasm; ice formation within cell organelles appears to be fatal. Our studies on this are continuing. How is this nematode able to survive in this remarkable way? The nematode survives 82 per cent of its water freezing. The freezing process is extremely rapid, with all parts of the body freezing within a few seconds. This is in marked contrast to other freezing-tolerant animals that take hours or days to complete the freezing process. Perhaps the survival of intracellular freezing requires the almost simultaneous freezing of all body compartments to avoid the osmotic stresses which would result if they froze at different times. The nematode produces trehalose at concentrations equivalent to those found in some freezing-tolerant insects, which might thus be acting as a cryoprotectant. Working with Craig Marshall of the Biochemistry Department of the University of Otago, we have recently demonstrated the presence of a protein that functions as a recrystallisa-tion inhibitor. Recrystallisation inhibition may be particularly important for the nematode to survive intracellular ice, since recrys-tallisation of the ice during long-term freezing might be expected to cause extensive damage. We are planning to isolate and purify the protein involved and to determine its structure so that we can compare it with ice-active proteins from other animals. Nematodes are essentially aquatic organisms and they are likely to undergo inoculative freezing from the surrounding water unless they have a structure, such as an eggshell or a sheath, which prevents it. P. davidi is the only nematode in which the survival of intracellular freezing has been demonstrated but such an ability may prove to be widespread among nematodes. Other groups of invertebrates, which inhabit soil or freshwater sites which periodically freeze, may be subject to inoculative freezing and need to be freezing tolerant to survive. Some tardigrades from Greenland and earthworms from Siberia have been reported to be freezing tolerant. Many ectothermic vertebrates (fish, amphibians and reptiles) overwintering in cold temperate environments can avoid the risk of freezing. They hibernate deep in the soil or at the bottom of ponds and lakes. Although the surface of a lake may develop a thick layer of ice, the water beneath remains liquid and, as long as the lake does not freeze completely, the temperature stays above 0°C. There are, however, a few species of amphibians and reptiles that hibernate in shallow terrestrial sites where they freeze over the winter. They need some special adaptations in order to survive in these sites. Why have they chosen such an apparently difficult and risky option for spending the winter, compared with vertebrates that hibernate in sites that are unlikely to freeze? When spring comes, the shallow sites of these animals are likely to thaw long before those of animals hibernating in more protected sites. The animals can become active quicker and can thus start feeding and growing. They are the first to exploit the resources that become available in the spring and are likely to be able to breed earlier and hence more successfully than their competitors. The first demonstration that a vertebrate could survive freezing in its natural habitat came relatively recently. In 1982, William Schmid of the University of Minnesota at Minneapolis showed that three species of frog could survive freezing. There are five species of frog that have now been shown to be freezing tolerant: Rana sylvatica (the wood frog), Pseudacris triseriata (the striped chorus frog), Hyla versicolor (the grey tree frog), H. crucifer (the spring peeper) and H. chrysoscelis (Cope's grey tree frog). The Siberian newt (Salamandrella keyserlingii) also tolerates freezing, with a range that extends into the Arctic tundra. There are two species of turtle, the hatchlings of the painted turtle (Chrysemys picta) and the box turtle (Terrepene carolina), which are able to tolerate freezing. Some other reptiles, including garter snakes, some lizards and some other turtles, can survive a small amount of ice in their bodies, but they do not survive if all the water that could freeze at subzero temperatures actually does so. Their ability to survive a small amount of ice formation, however, can be critical for their survival. The eastern garter snake (Thamnophis sirtalis), for example, commonly encounters subzero temperatures while it is active during spring and autumn outside its winter hibernating site. It will tolerate 35 per cent of its water freezing and exposure to subzero temperatures for more than 48 hours, enabling it to survive frost episodes, but it is killed if it freezes completely. During winter, the snakes hibernate in caves underground where they are protected from freezing. Suitable sites are in short supply and they may have to migrate long distances to reach them. Garter snakes congregate in enormous numbers and you are likely to find yourself knee deep in snakes if you venture into one of these caves during winter. The main laboratories studying freezing tolerance in frogs have been those of Ken and Janet Storey at Carleton University in Canada and of Rick Lee and Jon Costanzo at Miami University in Ohio. The wood frog (R. sylvatica) has been the main subject of their investigations. This frog has a wide distribution in North America, from the southeastern United States to Alaska. It generally inhabits damp woodlands and overwinters in shallow sites beneath leaf litter. These sites are damp and ice crystals can easily penetrate the skin of the frog. It will survive temperatures down to — 6°C, with 65-70 per cent of its body water frozen for four weeks or more. The freezing of R. sylvatica is initiated by inoculative freezing across the skin from ice forming in its moist hibernating site. Ice-nucleating bacteria have been isolated from its gut. These may trigger ice nucleation if the surface of the frog is dry and there is no inoculative freezing. There are ice-nucleating proteins in the blood but these trigger ice nucleation at temperatures below that initiated by inoculative freezing or by bacteria in the gut. The blood of many vertebrates, including those that do not tolerate freezing, contains proteins that have some ice-nucleating properties. This is clearly not their function in these animals and it is doubtful that the ice-nucleating proteins in the blood of R. sylvatica play an important role in the freezing tolerance of the animal. Since their hibernating sites are damp, there are likely to be abundant ice crystals in contact with the skin to produce inoculative freezing as soon as the temperature falls below the melting point of the frog's blood, at about —0.4°C. As in freezing-tolerant insects, freezing at a high subzero temperature means that the freezing process is slow and gentle and may ensure that there is no intracellular freezing. The freezing process takes 24 hours to complete at —2.5°C. Researchers have observed the freezing process in R. sylvatica by using proton magnetic resonance imaging (a technique used in medicine to provide images of the inside of a patient's body). Ice starts to form at one point on the surface of the skin, spreads over the surface and works its way inwards. The body cavity and the spaces between the frog's organs freeze next. This withdraws water from the organs and sequesters it into ice in the body cavity, which may help to prevent the tissues freezing intracellularly by partially dehydrating them by up to 50 per cent or more. The ice then migrates into the extracellular spaces of the tissues and organs themselves. The liver is the last organ to freeze. Once the frog is fully frozen, its trunk and limbs are rigid, its skin is covered in frost and its eyes are opaque because of the freezing of the eye fluids. Ice is found beneath the skin, between the muscles, a mass of ice fills the abdominal cavity and the organs appear shrunken. During the freezing process, physiological and biochemical changes occur within the frog that enable it to survive. Levels of glucose in the blood increase enormously, by its release from glycogen stores in the liver once freezing has commenced. This occurs very quickly, with the concentration of glucose increasing within a matter of minutes of freezing commencing and eventually reaching 100-200 times its normal levels. The production of glucose appears to be controlled by receptors on the liver cells that are sensitive to adrenaline. Adrenaline is a hormone that is widely distributed in vertebrates and is released in response to stress, eliciting a 'fight or flight' response. One of its effects is to trigger the mobilisation of glucose from glycogen, providing the body with fuel for action. Another of its effects is to produce an increase in heart rate. 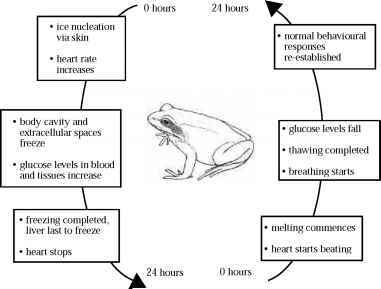 This occurs in the freezing frog, with the heart rate declining as the temperature falls but increasing markedly as soon as freezing commences. The increase in heart rate could also be explained by the elevation in temperature during the freezing process (in the form of heat of crystallisation). The increased heart rate ensures that the glucose produced by the liver is distributed to the tissues, that the tissues continue to be supplied with oxygen and food during the freezing process, and may assist in the partial dehydration of the tissues. As freezing is completed, the heart rate slows and eventually the heart stops beating altogether. Glucose is thought to act as a cryoprotectant by reducing the dehydration of cells and the amount of ice that is formed. It may also help preserve membranes and proteins in a similar manner to trehalose. The production of glucose in response to freezing occurs in the other species of freezing-tolerant frogs, with the exception of H. versioolor, which produces glycerol instead. High levels of glucose in the blood (hyperglycaemia) are damaging to most animals; in humans, for example, diabetes results when the regulation of carbohydrates breaks down. Perhaps the frogs can tolerate the high glucose levels since it only occurs after freezing commences and the frogs' metabolism is depressed as the freezing process proceeds. Recently, Ken and Janet Storey at Carleton University have been using a gene-based approach to search for freeze tolerance adaptations in frogs. This involves comparing the proteins produced by frogs after a freezing stress with those produced by control non-frozen frogs. They have identified several proteins, and thus the expression of several genes, which are induced by freezing. Among these are fibrinogens, produced by the liver. Fibrinogen is a blood protein that is involved in clotting, wound healing and repair. Its production in response to freezing in frogs suggests that survival involves the repair of damage, which occurs during ice propagation through the body and/or during thawing. One advantage of this sort of screening approach is that it can reveal adaptations which were previously unsuspected. Its application to the study of cold tolerance in animals (or to desiccation survival) is in its infancy, although there has been more extensive work on plants and microbes. During thawing, the processes that occurred during freezing are reversed. Thawing starts in the core of the body, due to higher concentrations of glucose in the organs, and spreads outwards. The resumption of heart activity is the first sign of life; it starts to beat even before the melting process is completed. This may be important to ensure that the thawing tissues are supplied with oxygen and to assist in the redistribution of glucose in the body. Glucose is rapidly converted back into glycogen in the liver, thus avoiding the stress of exposure to high glucose levels in the recovering tissues. Breathing recommences, the frog shows some sort of activity about seven hours after the start of thawing and normal behaviour resumes after 24 hours of recovery. The changes occurring in the frog during freezing and thawing are shown in Figure 5.7.
thawing frozen thawing figure 5.7 Some of the changes occurring during the freezing and thawing of the wood frog, Rana sylvatica. Insert drawing by Jo Ogier. this problem of freezing and thawing. They can also tolerate high blood glucose levels, low levels of oxygen and the other potentially harmful changes which occur in their bodies during freezing and thawing. Although the ability of certain frogs to survive freezing is now well established, there has been rather more debate over the role of freezing tolerance in reptiles. Painted turtles (Chrysemyspicta) have a wide distribution in cool temperate regions of North America, being found from the east to the west coast in the northern United States and southern Canada. Eggs are laid in shallow nest cavities in exposed banks. The turtles hatch in late summer but the hatchlings do not leave the nest until the following spring. They face low temperatures and the risk of freezing in their relatively exposed nest sites over winter. Temperatures as low as —12 °C have been recorded in their nests in the sandhills of Nebraska, where winters are particularly severe. Reptiles are much less susceptible to inoculative freezing than are frogs since they have a skin that is tough, dry and waterproof. Turtles have a shell, which may also provide some resistance to ice inoculation. The hatchlings of the painted turtle are small, which makes it easier for them to supercool. Much of their ability to tolerate the cold winter has often been ascribed to their ability to supercool. However, they can also survive freezing and can tolerate about 50 per cent of their body water as ice. They thus have the capacity either to tolerate or to avoid freezing. They cannot do both at once, however, since their ability to tolerate freezing requires freezing at a relatively high subzero temperature (little supercooling), while they cannot survive freezing following extensive supercooling. The strategy they use depends on the microenvironment within their nest over the winter. After freezing, the hatchlings can only survive down to about —4°C. To survive much lower temperatures (down to — 10°C to —12°C) the hatchlings must supercool. Their ability to supercool, however, is determined by the soil and moisture characteristics of their nesting site. Although turtles are less susceptible to ice inoculation than frogs, inoculative freezing from ice forming around them in their nest can still occur via the mucous membranes of the cloaca (the common opening of the digestive, urinary and reproductive systems), the nostrils or the eyes, and even via wounds in the skin. Exposure to freezing in sand, even containing as little as 2.3 per cent water by weight, results in inoculative freezing. In soil with a high clay or organic content, however, the hatchlings can supercool. Whether the turtles survive the winter by tolerating freezing or by supercooling thus depends upon an interplay between the thermal environment, the moisture content and the characteristics of the soil in its nest site.